Summer fun at Cool McCool’s Garage! 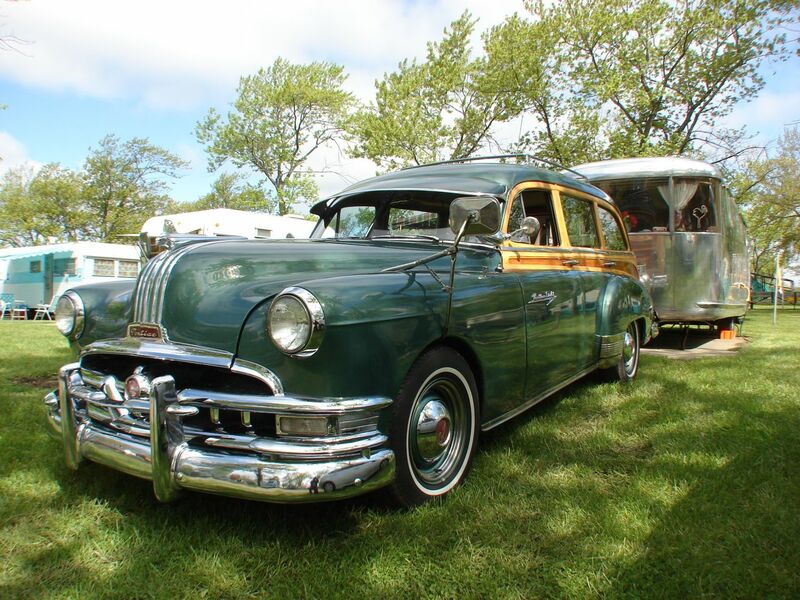 We went on our first camping outing of the year, with the Tin Can Tourists in Milford MI, at the TCT Spring Rally the weekend before Labor Day. Although the weather was NOT good for the first half of the weekend, we had a great time with all our friends. The ’51 Pontiac got to flex its muscles a bit and tow the Spartan over, Kim and I both commented on how comfortable it is, compared to the one ton Diamond T truck. 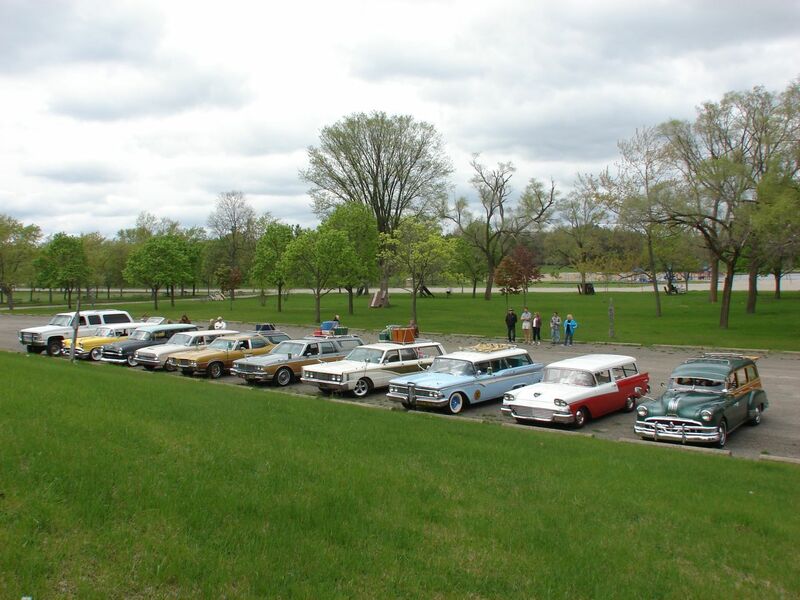 We had an impromptu “Station Wagon Parade” around the grounds of Camp Dearborn, with all our wagon owing pals, and had a ball. On the project front, the ’59 T’bird has seen no progress at all. I don’t feel very good about that, but, it’s not like other things haven’t happened. 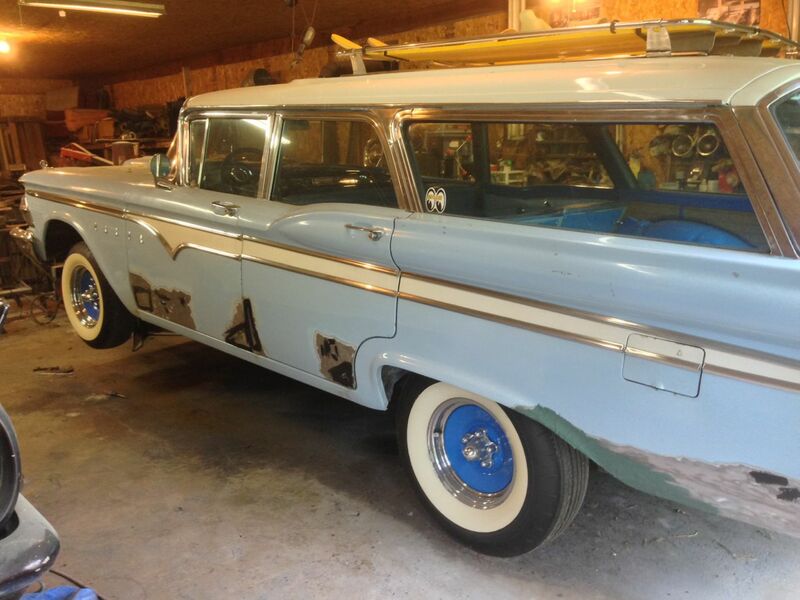 My friend Ron’s Edsel wagon got an initial spruce up, to take care of the rusty roof, and is now back for repair of all 4 doors, and a little quickie fix of the left rear quarter. 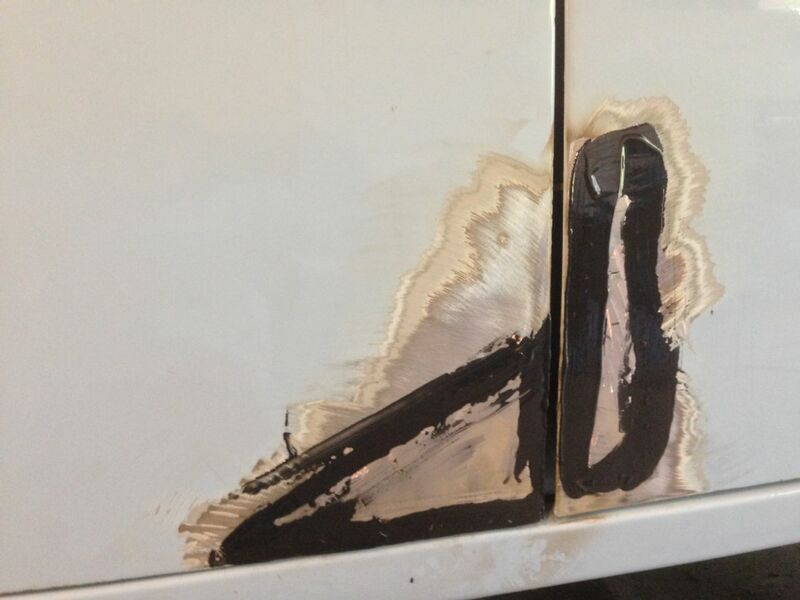 The doors present a challenge, but with a little tack welding, and the use of 3M “Panel-Bond”, we think we have a very acceptable repair for a driver. The quarter would be better repaired with a patch panel, but Ron is suffering from sticker shock at how much effort (and therefore how much money) the roof and doors are taking, so a correct repair can wait. It’ll look good, and we’ll take care of the rest when he’s ready. 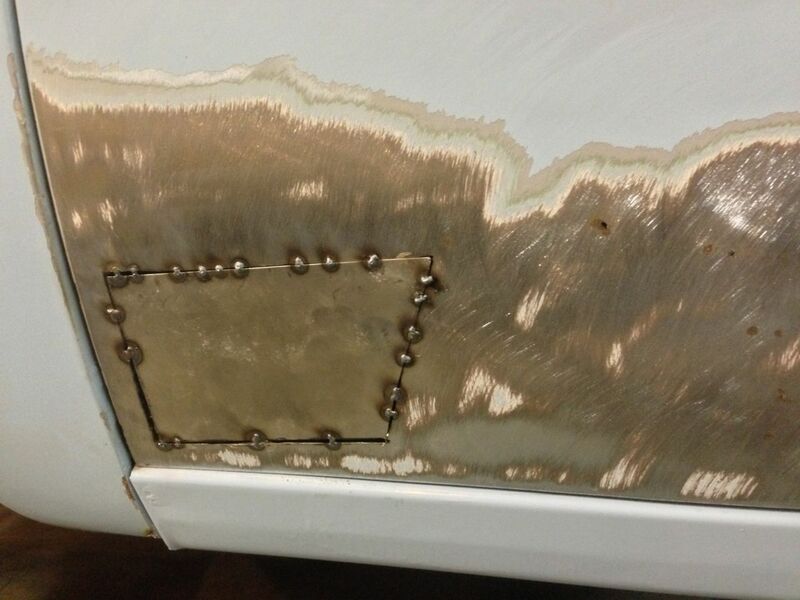 Tack welding patch panels in. Welding completed, 3M Panel-Bond over the weak to seal and waterproof. 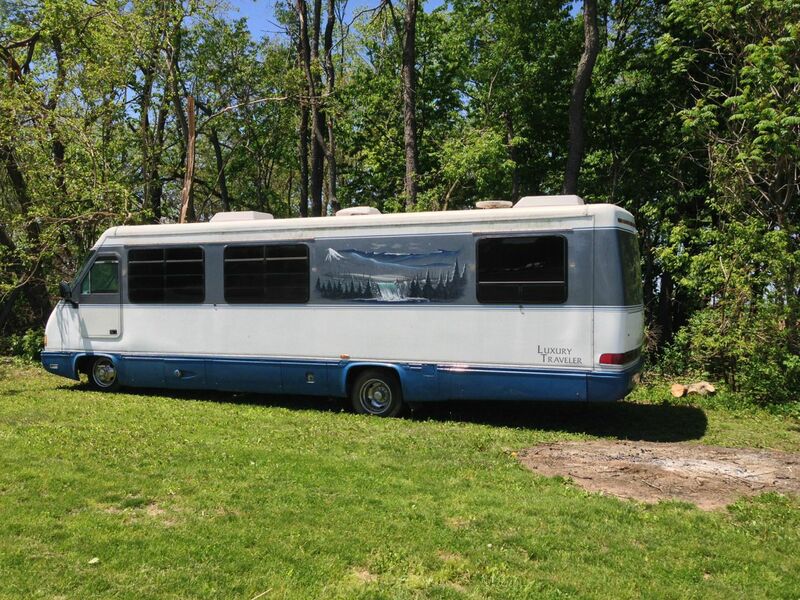 In a moment of weakness, last week, I brought home a late 80’s Starcraft motor home. This brute has only 14,00 miles on the clock, and sports a 454/400 Turbo combo that amazingly fired up instantly on the 12-year-old gas in the tank. After a lesson in the reliability of 25-year-old tires, I was able to pull it out of it’s resting place and drive it home. I enlisted the senior “Cool McCool”, my dad Rex, to come along, drive the chase truck, a real treat for him on his 90th birthday! After getting my eyebrows singed off seating two tires back on the rims using starting fluid and a match, and changing the right front tire which blew after rolling about 50 feet, we got home with no issues. The coach has an Onan 6.8KW generator, two slimline roof air conditioners, a big two-way fridge, convection oven, holding tanks, water pump, fittings, lines, fixtures, etc. that we can hopefully use in the soon to be started ’47 Spartan Manor project. Meanwhile, it’s hidden from view (at least from OUR view) in the back of the lot, and I’m trying to figure out what to do with the fiberglass body once I start cutting it up. The entire roof is rotten, and much of the left sidewall, from a leak in the rubber roof, so it’s not salvageable, Kind of a shame, but hopefully it’ll be worth all the effort dismantling it for the parts. Now we have to decide what to do with the chassis, it’s air suspension, hydraulic leveling system, cruise control, air conditioning, and miscellaneous. It’s home, now what will we do with it? So, that’s it for now. 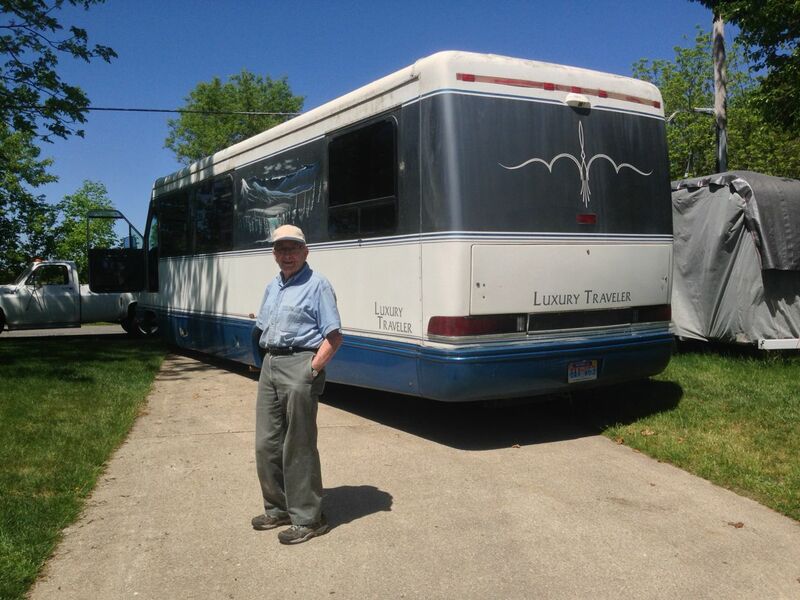 Stay tuned for updates on the motor home project (or come over with your Sawzall and maul and help tear it apart), get ready for updates on the T’bird and the rewiring of the dash and steering column, our latest camping expedition, and all the other activity here at Cool McCool’s Garage! Can’t wait for the Spartan project to start! If gathering parts counts, it’s already begun! So far, original Dixie stove, a stack of original Spartan interior doors, drawers, and misc. 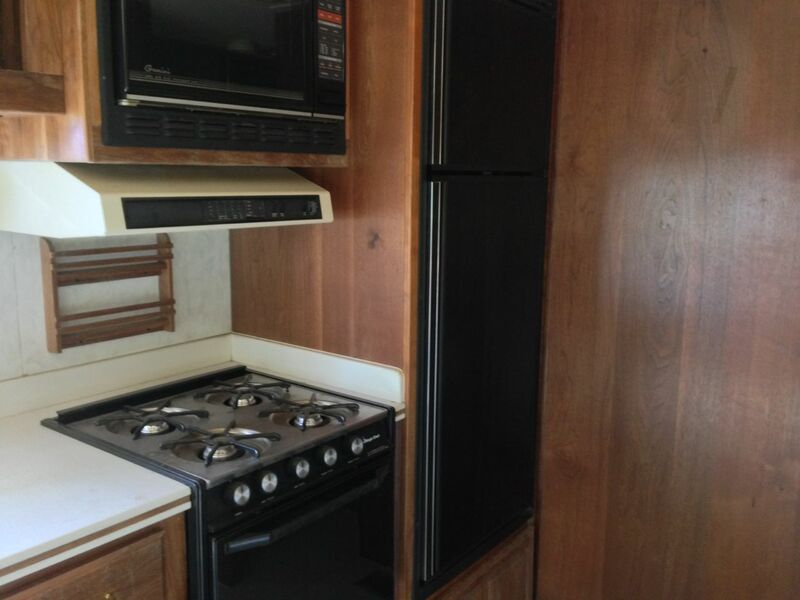 from a ’50 Imperial Mansion, an original fridge, cool upholstery fabric, and now whatever we can use from the Starcraft. Should be able to save the roof air units, water tanks, water pump, and more. I hope to pull it up to the garage and start stripping the interior by the end of summer, when all the other projects get cleared out of the way. It’s also inspired some hot rod friends of ours to get their own Spartan, so even though it’s not finished, it’s getting people fired up! You really do some great work! I have a 1946 Diamond T Model 306 I’m restoring. Like every other guy that’s doing a 1940’s ‘200’ or ‘300’ truck, I’m trying to hunt down replacements for the Left & Right Bumper Bracket Trim Cuffs and the Center Trim Panel just beneath the grill. The 200s and 300s are pretty much the same cab, and I saw how you made yours and they look sharp. Can I get in contact with you about these? Thanks in advance! Thanks for the response Brian. I was attempting to refer to the two sheet metal “kidneys” behind the rubber, and for that matter the rubbers too. 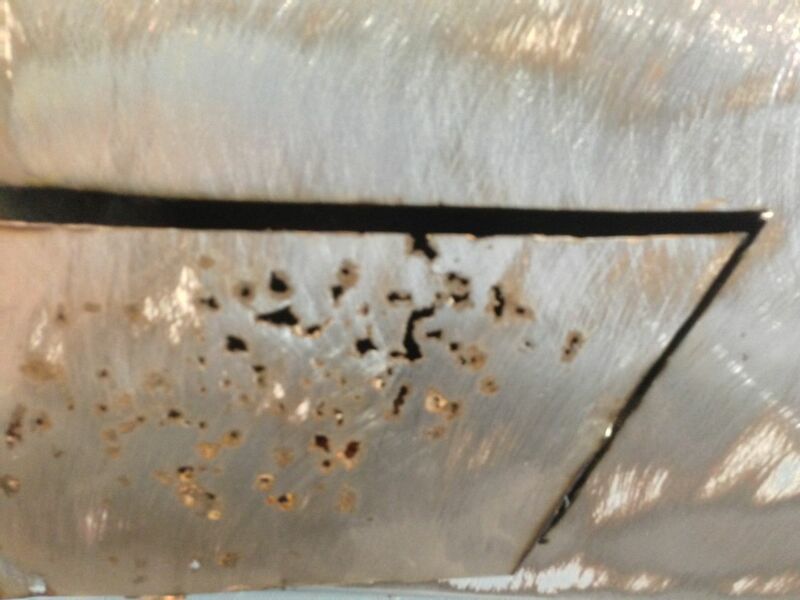 The center sheet metal beneath the grille as well. Thanks again for the correspondence! THAT, my friend, is the way to collect parts for an RV project. I like the idea of a snazzy forward control ramp truck. Should sell “easily” and recoup some much needed cash. I was “into” Spartans for a few years. Sold most of my parts to Flyte Camp restorers in Bend, Oregon. I just ran across a hidden stash. Small stuff. Looking forward to watching that Manor come together. Sounds like it’s pretty good just the way it sits! I am finishing up a 78 Ford ex-motor home flatbed truck. The plan was to build a “shack” on the back of the original low mileage 351/C-6 1 ton. I even went out and bought a full set of 7 16″ steel wheels to replace the 16.5’s. It just looked more and more like a HUGE project. It should look like a real work-horse with full racks when finished and sell in a heartbeat. I found a ’69 AMERI-GO self contained truck camper (top a the line in 69) and am going with customizing that to haul with my 93 Ford 7.3. 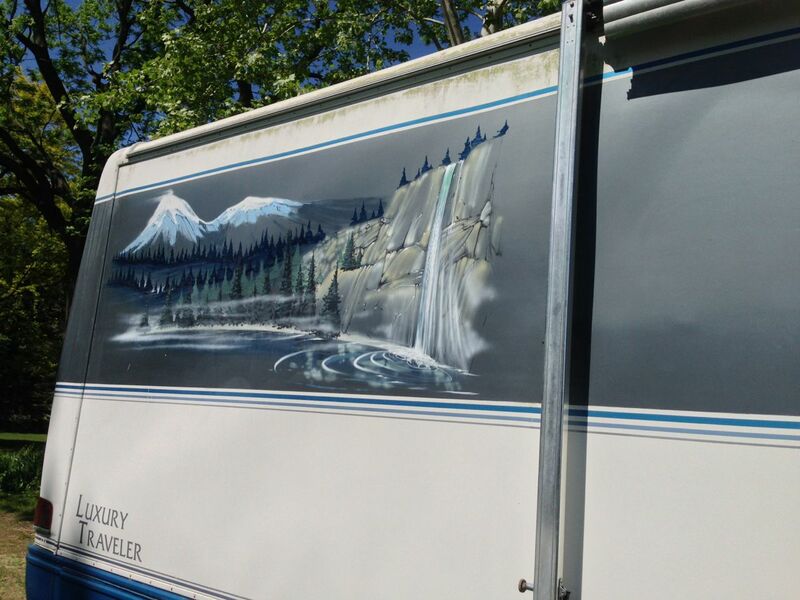 Gotta get that flatbed OUT of the garage so I can put the Ameri-go IN alongside a very old cute little Airstream commission job. The T-Bird is going to be SO SLICK. Thanks Joe! We’re having fun! It’s Father’s Day, let’s blow something up.